Benefit for Sandy Hook at The Talking Stick: March 2nd - Yo! Venice! 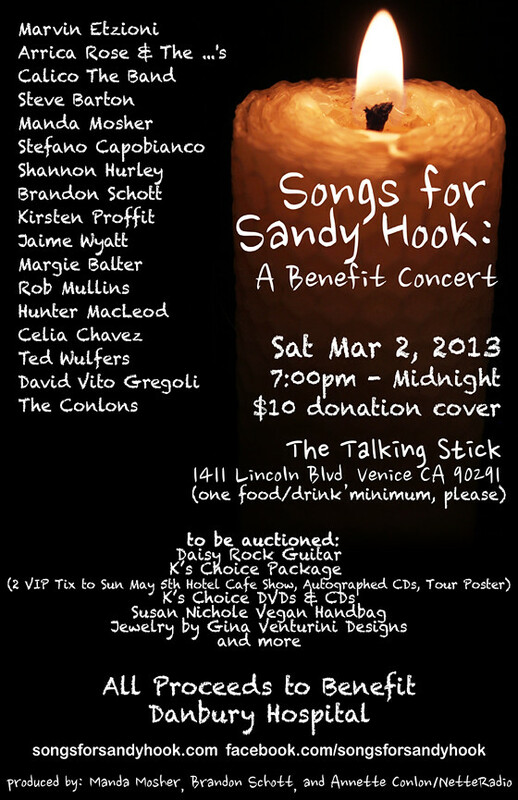 On March 2nd, The Talking Stick will host an evening of music by the “Songs For Sandy Hook” compilation artists. 100% of all proceeds to Danbury Hospital. Featured artists will include Marvin Etzioni, Arrica Rose & The …’s, Calico The Band, Steve Barton, Manda Mosher, Stefano Capobianco, Shannon Hurley, Brandon Schott, Kirsten Proffit, Jaime Wyatt, Margie Balter, Rob Mullins, Hunter MacLeod, Celia Chavez, Ted Wulfers, David Vito Gregoli and The Conlons. Auction items will include a Daisy Rock Guitar, K’s Choice Package (2 VIP Tix to Sun May 5th Hotel Cafe Show, Autographed CDs, Tour Poster), K’s Choice DVDs & CDs, Susan Nichole Vegan Handbag, Jewelry by Gina Venturini Designs and more.